The purpose for examining this nutmeg grater is to corroborate its maker's mark in relationship to all its general features and characteristics. The form of this silver nutmeg grater is generally known as a domed cylinder nutmeg grater with double lids (Fig A1). It measures 1¼ inches tall by 9/10 inches in diameter (30.43mm X 22.16mm). Its total weight measures 10.7 grams. As described below, this artifact displays some uniqueness in its design. Contained inside a rectangular mark with rounded corners, the maker's mark "J•R" is styled using Roman font capital letters separated by a centered pellet (Fig B2). The maker's mark is centrally located on the bottom friction fit cover. Under magnification, the mark's outlining edge is jagged and a double strike mark is evident. This dome covered cylinder nutmeg grater with double lids, was purchased at the auction of Pook & Pook, Inc. 463 East Lancaster Avenue, Downingtown, PA 19335 on January 16, 2010. It was described in their catalog as "Lot 1032 ~ Philadelphia silver nutmeg grater, ca. 1800, bearing the touch of Joseph Richardson, Jr. 3 oz., 1 1/8" h."
The auction was widely publicized in the antique press. The nutmeg grater was advertised, including being pictured on LiveAuctioneersCom and ArtfactCom. Following the auction, the nutmeg grater was featured in the Maine Antique Digest, April 2010, Section C, Page 41(Fig A2). During the days prior to the sale at the auction preview, this antiques collector reported the growing concerns regarding "faked American marks on silver nutmeg graters" and questioned what provenance was available. In response, both the lead auctioneer and an auction owner reported that this nutmeg grater was "from an old Philadelphia family whose primary collector had died years earlier". They described that a current family member, "a daughter was becoming elderly and that she periodically sold pieces that her father had collected". Both the lead auctioneer and auction owner agreed, "These items were collected long ago," and thus, "there was no reason for concern.... this item is authentic!" No specific provenance was provided by the auction owner nor the head auctioneer. For "confidentiality" they would not disclose the owner's identity. This nutmeg grater is a silver screw-top dome-covered cylinder nutmeg grater with a friction-fit bottom lid. 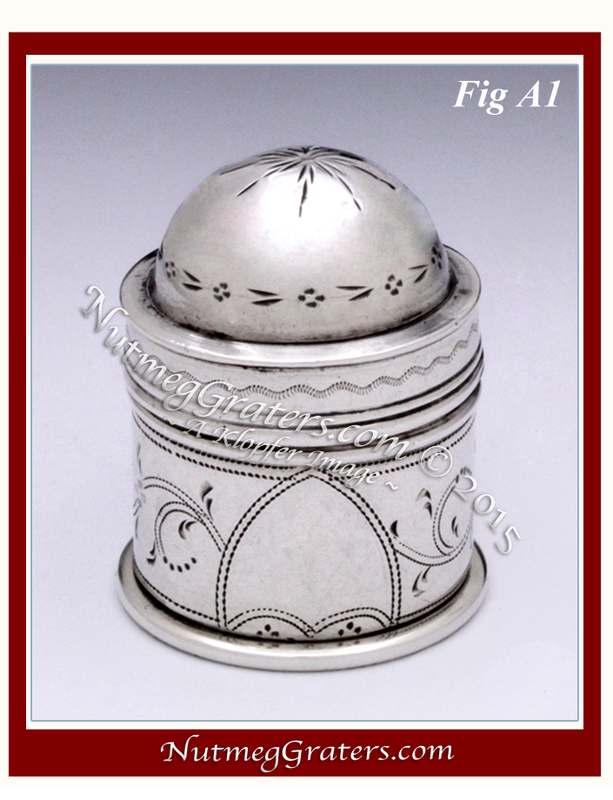 Dome-covered nutmeg graters are common products by smallworker's in silver from Birmingham, England. The Klopfer's image file is a collection of several thousand detailed photo images of nutmeg graters: [sources include but are not limited to ~ books and auction catalogs, on-line sales or auction archival resources, private and public collections.] Among these files, more than one hundred examples of dome covered cylinder nutmeg graters are documented. Of these, approximately 20% are unmarked. Marked examples seem exclusively produced by Birmingham silver smallworkers' such as Samuel Pemberton, Joseph Taylor, John Turner, and Cooks & Bettridge and include date marks which range from 1789 to 1820. To date, using scientific measures, no example in this form is confirmed as American in origin. The example under investigation within this study appears atypical to other English examples because of its distinctive friction fit bottom lid that inserts inside the body's interior wall ~ in addition, this lid uniquely leaves an outer rounded~lip collar that encircles the bottom of the grater's body. ~ John Robertson (mark entered 1826) London [jeweller of rings]. ~ Joseph Richardson Jr. (1752~1831) of Philadelphia. Little is report of John Robertson of London. His maker's mark was registered in London in 1826 . Robertson is listed as a jeweller. As typically found with jewellers, Robertson's maker's mark "J•R" was made using a very small "jeweler's punch" which renders a maker's mark much smaller than the mark found on the nutmeg grater in question. Joseph Richardson Jr. was a prominent American silversmith and much is known about his work. His records are well researched and it is known that he produced a silver tear-drop form pocket nutmeg grater. The earlier examples were made in conjunction with his brother Nathan Richardson and are marked "INR". Later examples, made after the brothers separated their partnership, were marked "J•R". Several confirmed examples of the Richardson's tear drop form nutmeg graters are known. MAKER MARK ANALYSIS ~ A Spurious Maker's Mark. In Joseph Richardson and Family Philadelphia Silversmiths by Martha Gandy Fales, maker's marks for the Richardson family are well authenticated. Fales identifies three Joseph Richardson Jr.'s maker's marks (however, only one of his marks used the centralized pellet). 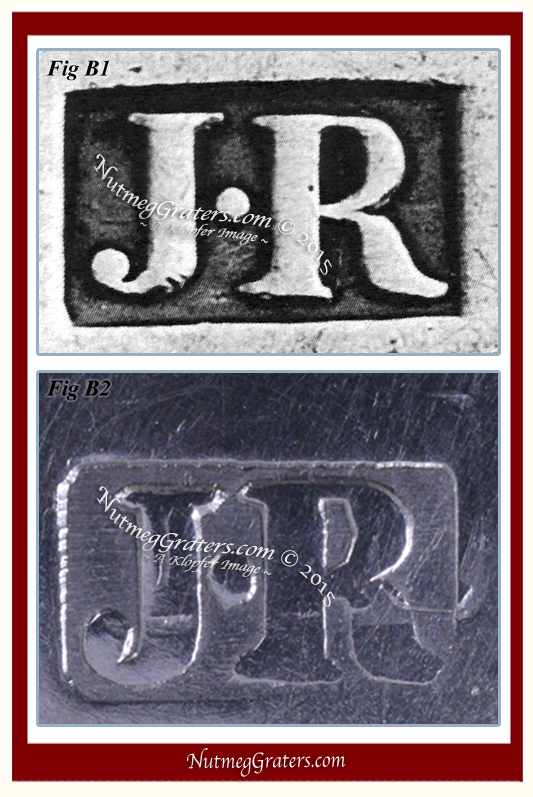 Obtaining a confirmed "J•R" image representing the work of the Joseph Richardson Jr. Circa 1790-1810 (Fig B1), a direct visual comparison was contrasted against the Canon MP-E-65 image of the maker's mark under investigation (Fig B2). Confirmed examples of this Joseph Richardson Jr. Circa 1790-1810 maker's marks were acquired from multiple sources [including Winterthur's Decorative Arts Photographic Collection (DAPC), a collection containing abundant materials pertaining to all of the Richardson family "marks"]. Using Direct Visual Comparison between high definition images, significant differences become apparent. Contrasting these two marks, notice with the letter "R" (Fig B2), the opened center (the bowl) is crudely misshaped and more narrow than the authentic mark (Fig B1). Further, the authentic marked "R" elegantly narrows in the center where the "leg" and "bowl" intersect with the main "stem"; but with the mark in question, these same intersecting features are crude and oversized. Viewing the mark's outlining perimeter, there is jagged edge along the top and the left borders which reflects the poor craftsmanship by the person making the forged marking die (punch tool). The maker's marks neither match in letter proportioning, nor in the quality of die-cutting refinement. Richardson Dome Covered Cylinder Grater marked "J•R"
Findings are based on copper [Cu], gold [Au] and lead [Pb] concentrations. Dr. Mass wrote, "Note that this piece exceeds the English sterling standard of 92.5, and that the underside "The Bottom Lid", which contains the maker's mark, is a modern replacement" containing no trace element of "gold" [Au]; thus, without question rendering this mark as fake. Based on the results from an investigative profile, this domed cylinder nutmeg grater with double lids bear a "spurious maker's mark", purportedly attributed to Joseph Richardson Jr. of Philadelphia (1752~1831). "The Bottom Lid" containing a maker's mark is constructed from modern silver. Although the main body of the piece slightly exceeds the English sterling standard, the form of this piece appears exclusively to be of British manufacture. NutmegGraters.Com.) If you believe that you have been the victim of such fraud, please feel free to contact this site.